I generally take a top down approach to designing my world, meaning that I start at the higher level and drill down where I want or expect play to actually happen. So I will start with an area of the continent, and create the geographical environment. I will consider terrain from the point of view of the races that will inhabit it. What are the strategic points? Often strategic points are located at passageways into a region, such as a mountain pass, a harbor, or on a high point overlooking a fruitful plain. I will select several of these, in the mode of pre-history, before any races populated the region. Wild beasts roaming there will not usually pay much attention, but later intelligent races will. 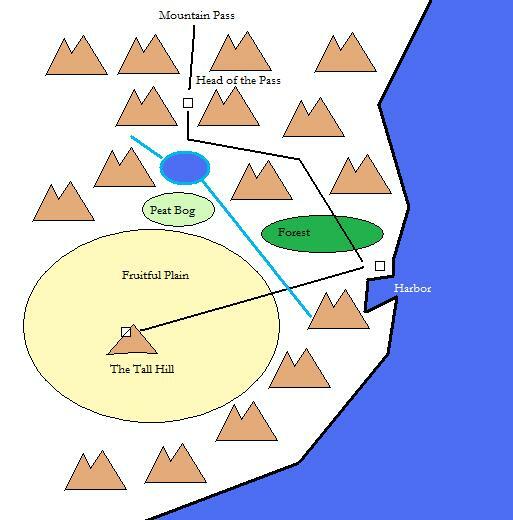 But in the meantime, there are, for the sake of this example, three locations of strategic import: ‘The Head of the Pass’, ‘The Harbor’, and ‘The Tall Hill’. I will then consider the avenues and barriers between them. In this case, for my example, I think I will create a triangle of pathways since there are three strategic locations. Between the ‘The Head of the Pass’ and ‘The Harbor’ I will have an avenue that one day will become a road but in the beginning starts out as an animal trail. I will also add a barrier, which is a forest that may be populated later with any number of beasts, or villains. The avenue therefore passes through the forest which sets up that pathway as having an avenue and a barrier. I like to combine them. Between ‘The Harbor’ and ‘The Tall Hill’ I will put another avenue. This time I will have a river as a barrier, which at first cannot be crossed except by fording, or swimming, but later I imagine there will be a bridge built at the ford. This avenue will be little traveled for a long time, until there is a town placed on the hill and the harbor discovered. That may take many centuries. So that pathway also has one avenue and one barrier. So far so good. Between ‘The Tall Hill’ and ‘The Head of the Pass’ I may put only a barrier to create a challenge for later and keep things interesting. Let’s say a peat bog. And how about a nice big mountain lake, in which dwells a monster, or perhaps a band of Nixies? That will make for some fun adventures later. I might even put a treasure at the bottom of the lake. How about a rare magical gem that happens to have fallen from the mountains there? If one day a hero should slay the lake monster, or defeat the Nixies (I have not decided which yet, and maybe I'll have both), then the gem might be found, and a new magic item for the World crafted from it. Could happen! So to get to ‘The Tall Hill’ from 'The Head of the Pass' one must go to ‘The Harbor’ and then cross the river, or one can dare to attempt crossing the peat bog (a bad idea, probably, unless you happen to be an an especially hearty adventurous sort). I am now able to begin developing a history of this region. I can begin it quite arbitrarily, actually, by posing that there are three primary races that occupy the region. The first comes from the West, and occupies ‘The Tall Hill’, and I’m going to say this is a hearty band of farmers who decide to start planting along the lower rim of the hill at the base of the fruited plain, wisely led by some priest of the Elkron of the Earth to do so, no doubt. Eventually that Hill may become a Fortified City, but at first it is just a poor little hill town trying to eek out a living along the edge of the plain. At the same time, a hero of a band of Elves living in the forest for ages is taught fishing by the Elkron of the Sea, and so decides to occupy the rocky land on the north shore of the harbor. He and his ilk eventually create rafts to help them fish and ferry, and go on to become boat builders, and are destined to rule the seas thereabouts (unless something goes horribly wrong for them - don't laugh, it could happen). 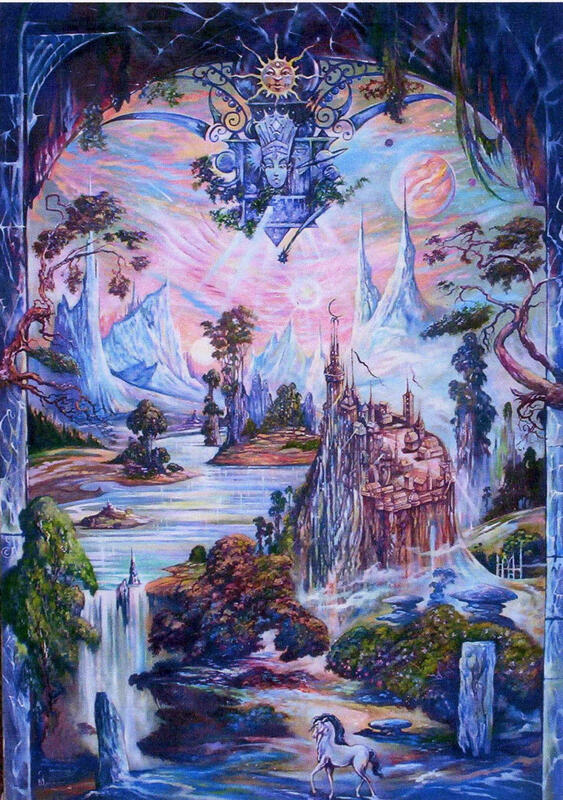 And so the Elves split into two tribes, one of the forest, and one of the sea. On the pass, I will put two small warring tribes, say of Ogres and Trolls. These folk are only semi-intelligent, but use a rude form of earth magic, and can hide in the ground, mostly occupying caves and waterfalls. They're cruel and hunt anything that moves. Fortunately for the region neither tribe is very large, and they mostly feud with one another, and leave everyone else alone. Unless they get too darn hungry, in which case some one or a few might venture down the slopes. On the other side of the pass is another rich land with many wonders to be discovered one day… but not for a long time, no doubt. And so it came to pass that the Elves of the Sea met the Farmers of the Plain, and began a mutually beneficial trade of fish, and produce. Things progressed and eventually two towns were built up nicely, Hill Town and Harbor Town. At some point they collaborate on building a nice stone bridge over the river. All is well. This mutually beneficial relationship worked very nicely for a long time, until one day an ogre of ill repute, and worse manners, wandered hungry from the mountain. First trying the peat bog, he lived a rough existence for some time, until he’d hunted all the game there. He moved on, wretched creature, until he came to the forest, in which he dwelled for some time with his equally loathsome wife. This began to impact the Elves as they recognized a change in the forest, and were loath to go there, since the Ogre was very cruel, and powerful, and his wife was even more so, and a mystic of evil intentions. The northern forest began to be populated by wolves, and bats, and stinging insects, and storms gathered over it, and it became brackish and unwholesome. It was then, finally that the Forest Elves decided it was high time to send some hero or other to rid the wood of the Ogre. But who would dare to face such a grizzly couple as the Ogre and his wife? And so, we have a basic setup for a Campaign. It was not very difficult, once the groundwork had been laid, and things followed along rather easily after that. And so, for those who wish to create their own Campaigns it is not so difficult really. It just requires considering a few aspects of the geography, the history, what races, and adding some history. Of course, this is a very simple and basic example, from which a lot more history and whatnot could be derived, and you can consider that the Campaign action could take place anywhere along the timeline. Note that if you do chose to pick a middle spot in your timeline then that would give you the ability to provide foreshadowing or perhaps "prophetic" insights to the Player Characters along the way, as well. Not a bad option, if you do so with discretion and care. The next thing I would do to fill things out further is create the Primary Non-Player Characters of the Region. I would consider the King of the Ogres, the King of the Trolls, the Lord of Hill Town, and the Lord of Harbor Town. I would create Non-Player Characters for each, and their immediate families, whomever is important and plays a role in the setting, such as the Hill Town Lord’s selfish wife, or his heroic eldest son perhaps. I would create a few colorful NPCs to fill in the towns a bit. Some of them would be famous for something, while others would be ordinary folk, such as the corner baker, his daughter, and the local snake oil peddler, and his ilk. And so on. Over time once I've filled in the towns with various NPCs, and given them little histories, and some aspirations, perhaps, I would then add villains, a few monsters or really rotten people to spice things up, and then finally add the essential important artifacts over which the people squabble. Is there hidden gold in that there Hill? Is there a magic sword that the Elkron placed anywhere as a Seed of Destiny? Is there a wizard who has created magical artifacts that have created troubles here and there? Or a famous sword smith who happens to be very talented at his craft but whose dark sense of humor has infected his swords with a curse of some kind? All of these things will get added to the setting over time. And voila, the Campaign setting is ready, and even has something of a life of its own. Now when the Player Characters go adventuring in the region there is an underlying layer of coherence to things, a story that is already going on beneath the immediate concerns of the Player Characters, and so the world has a much better chance of feeling ‘real’ for them than otherwise. This is what I have found works for me. Best wishes on your Campaigns! At the Literary Role Playing Game Society we have often discussed the fact that there are different Gamesmastering styles. Recently I ran across The GM Merit Badges idea, which originated at Strange Magic Blog. I think it is a brilliant set of icons to define different aspects of Gamesmastering, and I have divided them into two basic groups, Game Mechanics, and Story Orientations. The Badges artwork is courtesy of Lorc (many thanks, nice job!). To see the definitions of the GM Merit Badges please visit Strange Magic Blog. Taking it just one step further, here is my take on the combinations of Story Orientations (across the top) vs. Game Mechanics, showing which ones I think go best with which. Of course, I will be the first to point out that this is a rough guess, and certainly open to differences of opinion based on alternate interpretations of the meanings of the Badges. However, it's probably a good initial stab at it, so here it goes. Green = pretty good chance of success. Yellow = success is possible, though not necessarily probable. Red = success seems problematic. Simply put, Suspense is not knowing what is going to happen in a situation where the results are important to the observers. For Gamesmaster’s running RPGs there is always a wish to create a sense of suspense for the Players. For Players the suspense is an enjoyable aspect of the game. So I’d like to talk a little bit about techniques that can be used to create suspense in the game. First, we should note that there are two avenues of suspense. One is related to the mechanics of the game and affects the Player. The other is related to the story of the game and affects the Player’s Character. In the first case suspense is usually inherent in the act of rolling the dice. That kind of suspense is mechanics-related. To mitigate the chances of failure the Players often try to maximize their chances of success by doing things like maximizing their Character’s stats, but also can be things like strategically or tactically positioning the party members to maximize combat advantage, or using the appropriate weapons or mystic powers, as well as such mundane things as purchasing the right equipment for the adventure, which might entail previously having re-conned the location, or having done prior research. A well organized and effective approach to a situation can provide the necessary bonuses to make the difference between “high chance of fail” and “a good chance to succeed”. And so we find that the mechanical aspect of suspense is related to preparation in some way. When Players work hard at thinking through their approach to a situation, then their investment in time and forethought can add considerably to the suspense they feel when rolling the dice. Encouraging Players to think through the issues, possibly through some vague but intriguing comments by NPCs, can add to the mechanical suspense the Players feel when the dice get rolled. Another aspect of Player oriented suspense is what I think of as The Player Character Death Effect… knowing that in any given combat the Player’s Character can get killed. This is a tricky one. The Gamesmaster has to negotiate a delicate balance in relation to Player Character death. How do you provide enough evidence in the game that the Player Characters may indeed get killed, but not cause the Players to feel too much anxiety at the possibility of their Character’s death? I had an experience like this in my game. One of my Players, having had her Character killed once (although she came back to life after an adventure through the underworld), became averse to taking what she considered “unnecessary risks”. This actually lead to her leaving behind an important and well beloved NPC who was trapped in a spider web because she could not tell if the mumblings coming from the large lump of webs were from a friend, or a monster. So with great hesitation she finally decided to back away and not take the chance. She didn’t want to risk being killed again. So, that’s one aspect of what makes The Player Character Death Effect a challenge for Gamesmasters. Another problem is that some Players take high umbrage at the death of their Characters and leave the game. A related problem I ran into once was that one of my Players was so crushed by the fact his Character died that he broke down and started crying. On the one hand it certainly proved that he had an emotional attachment to his Character, which is laudable, but also proved that some Players have a very hard time letting go of beloved Characters for this very reason. So these are issues that have potential to disrupt, if not actually ruin a game. And yet, the solution that some Gamesmasters adopt, which is to spare the Player Characters from The Player Character Death Effect by fudging the rules, or modifying the dice rolls when they have resulted in a Player Character death, can also be problematic. Without the credible threat of Player Character death, the Players may conclude that their Characters have some sort of Gamesmaster initiated God-Mode turned on, and start behaving badly. I’ve seen that before. Knowing that the Gamesmaster won’t let them die, some Players take advantage. They begin to take chances that would be absurd under any other circumstance. It kind of ruins the sport of the game when this happens. The other side of that same coin is that Players may become disinterested in the game. If you know you can go into any battle with any creature, and not die, then the die rolls are going to ultimately not be very suspenseful. After a while, just like being allowed to eat as much candy and ice cream as you possibly can, it becomes un-fun. I think overall the most important feedback that I’ve gotten from Players is that if they must die, the wish they could die well. That means that they prefer that they die in some climactic way that exemplifies their heroic nature, and not because of some dumb minor incident during which they just “rolled bad” and died. That’s understandable. Unfortunately, that’s difficult to engineer in a game where Players take chances when they choose, and roll the dice to determine the outcome. One bit of advice in this regard that I give my players is “maximize your chances of success, and try to minimize dangerous actions that have little importance to your Character’s goals”. Other than that the Gamesmaster cannot really do much more, other than to try to guide the adventures along pathways that have importance to the Players, and minimize the dangers associated with non-critical paths in the game world. So the GM has to negotiate Player Character death pretty carefully. That means keeping an eye on balance of forces in every combat situation, as well as other situations, such as the effectiveness of poisonous traps, the results of dangerous non-combat tasks, etc. Depending on the rules system you use to run your game this can be either relatively easy or rather hard (if not impossible) to do. Yet as Gamesmaster you have to be cognizant of the issue just the same. Personally, I choose to use a rules-light system that gives me a reasonably good chance of being able to estimate chances of survival in any dangerous situation, and so I can adjust values relatively easily to hopefully mitigate the odds of Player Character death. 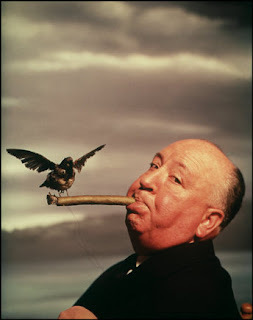 Another aspect of suspense is much less about mechanics, but just as important. It is the Plot-Suspense that accrues when the Character’s themselves are involved in suspenseful activities that are not related to die rolling. For example, the resolution of a mystery, where the suspense is in figuring out Who-Done-It, and the possibility of danger until the mystery is resolved. This is much more of an art than a science, but the Gamemasters who manage this aspect well provide yet another form of suspense for the Players that can be very entertaining. I’m thinking of one example from my game where the Players were carrying around a monster inside one of them, and it did not become apparent until the end, when the last remaining Player Character was running along the path and suddenly it dawned on her what had happened, just as her companion behind her was transforming into the monster. She turned to look, and I have to say the look on her face at that moment was priceless! There are some thoughts on some aspects of suspense in the game. I’d be curios to hear your reactions. I take a traditionalist view of creatures and monsters in my world. And so I spend a good deal of time combing through old fairytales and folklore trying to discern what our forebears thought the creatures of myth and legend were like. As it turns out, modern views of creatures like Hobgoblins differ quite a bit from the traditional versions. As an example I'll take Hobgoblins. First off, the view that Hobgoblins are larger, fiercer fighting-monsters than Goblins is quite a new conception it seems. Rather, in the old days, Hobgoblins were thought to be rather small, and in many cases simply another, and somewhat diminutive version of Goblins (which have a very wide range of types themselves, as Goblins appear to be a species with many sub-species associated to it). Hobgoblins were about one foot, sometimes two feet tall. They had great heaps of hair, most often brown, gray or black, though sometimes red, with huge mustachios, and large bushy eyebrows. They wore, mostly, brown or gray rags, and often went barefoot. They mostly lived in people's houses, and could be rather helpful, doing dishes while their patrons slept, or cobbling shoes, or sweeping or any number of other useful household tasks. 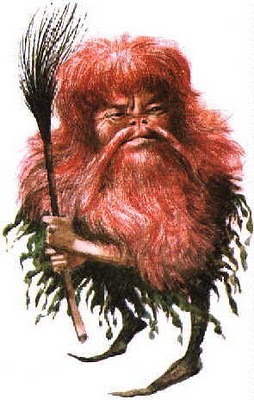 What they expected in return were small gifts of food, such as honey-cakes, to be left on the "hob", which was a rocky protrusion that would be attached to the fire place, from which they derive their names... they were Goblins of the hob, or Hob-Goblins. Hobgoblins were fond of pranks, especially if they felt slighted. Failing to leave a cake on the hob would certainly cause the household to run into troubles. One famous Hobgoblin by the name of Hob-Robbin, when angry, used to steal all of the keys in the house and hide them until a honey-cake was left on the hob for him. Then he would throw the keys at the wall and they would all clatter to the ground in a jumble. Other pranks would include tying the horses manes into knots, throwing pots and pans around at midnight, clogging up the well, and other nuisances. They could be mischievous, but I have yet to hear of a single case where a hobgoblin actually physically attacked anyone, or caused a death. The most certainly did not carry weapons or wear armor as far as I've been able to discern. I like to use traditional folklore as a basis for my world's creatures because they feel more authentic to me, and I feel they add a more interesting and colorful flavor to my world, just as they did for our father's father's fathers. The Fey, of which Goblins and their ilk are members, can be mischievous, helpful, friendly, rude, hostile, or deadly depending on the type and the circumstances. One general rule, however, that seems to hold in most cases, is that being polite to the Fey makes a big difference in terms of how they will treat people. So, in Elthos, Hobgoblins are not the fearsome fighting-creatures of contemporary fantasy-lore (though there are plenty of other creatures which are, of course). Hobgoblins are instead rather amusing, sometimes helpful, magical little creatures who in fact often have quite a bit of knowledge that can be coaxed out of them with the right kind of talk and gifts. That knowledge can be extremely valuable at times. So if you should meet a Hobgoblin in Elthos, remember that they are fond of honey-cakes, clever riddles, and interesting local gossip... perhaps you will be rewarded with a bit of news, or folklore, or other tidbit, that could be quite helpful. To find out more about the traditional folklore creatures you might like to read Nancy Arrowsmith's book, Field Guide to the Little People. Note: default Base Kill Gain Multiplier = 1 but can be adjusted to increase or decrease the rate of Levels advancement. The higher the BKGM the faster the Characters will gain Levels. The default of 1 seems to provide the best value for Campaigns where the expectation that Characters will advance to 6th Level (maximum in most cases) in approximately a year of play. If a Character wins a Solo Combat, such that no other party members are in range to provide support, then the experience is not shared, and the value of the Experience Gain multiplied by 2. Otherwise, however, Combat Experience is shared with all of the members of the party equally. If a Character tries to perform a learned skill such as swimming across a fast moving river, which the GM has assigned a Difficulty Level of 5, then if he succeeds by rolling above the Chance to Succeed value, he accomplishes his goal and gains 5 Experience points. A special case might constitute any situation in which the normal amount of Experience Gain seems insufficient. For example, if the opponent in a combat situation is using magical weapons or armor, the GM might add a bonus Experience Point for each bonus value of the magical item. Conversely, if the Victor was using a magical weapon or armor the GM may wish to reduce the experience gained by an equivalent value. The use of Mystical Powers earns Experience Points as does any other learned Skill or Combat Skill depending on the nature of the Mystic Power. 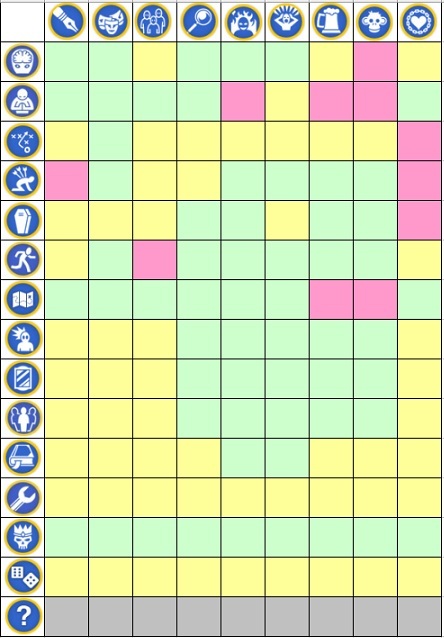 To give you an idea of how these small numbers of Experience Gains relate to how much Experience is required for Character Leveling here is the Chart. You will note that the top value is the Experience Base for the Class, and it doubles for each level, which makes calculating the required amount reasonably simple. Remember that the idea of the Elthos "One Die System" is to keep the numbers small so that they are easy to handle during the game. The current configuration should allow Characters to get to Level 6, on average, in about 1 year of play if the GM runs the game once per week, more or less. Note that Multi-Classes combine the bases -10 / additional Class to so that a Fighter(20)-Thief (20) has a base of (20+20)-10=30, a SpellChanter(30)-Thief(20) has a base of (30+20)-10=40, and a Fighter(20)-SpellChanter(30)-Cleric(30) has a base of (20+30+30)-20=60. One of the better known historical facts regarding Hamfest, that sleepy little swine-herder village on the edge of nowhere, several days north of Glendale Township, is that they were on the front lines of the Ogre War, and in fact saved Glendale with a clever, if somewhat cruel stratagem. In those days the Adventure's Guild had sent an expedition westward to investigate the Iron Hills, which had been recently discovered, and of which nothing much was known. As it turned out the Iron Hills were riddled with tunnels and warrens in which a vast number of Kobolds, Goblins, and Ogres had lived for a very long time, unknown and unsuspected by the people of Glendale. 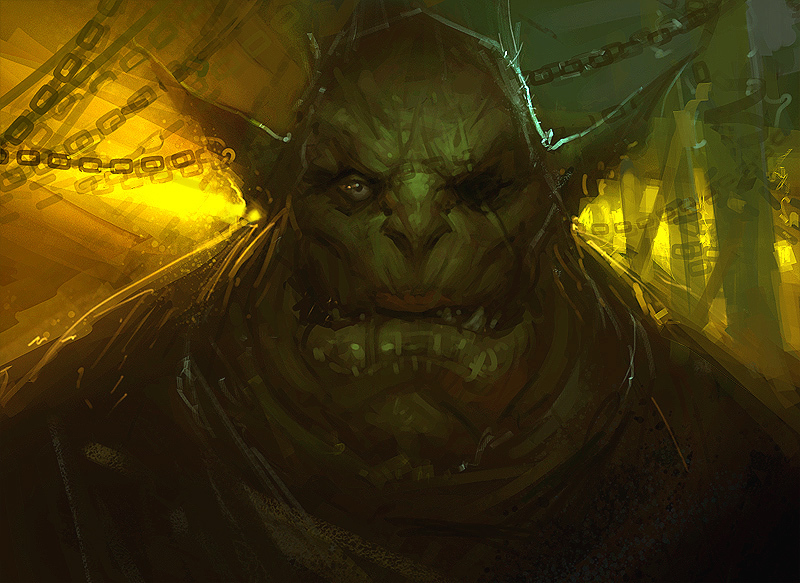 Nor had the Ogre-folk known that the humans had settled in Glendale Valley at that time. And so it was that the wrath of the Ogres was aroused, and they began to wage war on the people of Glendale. It began with small expeditions that burned down farms, and sacked small villages in the south. Then the east, and finally a large army was formed with the determination to push the people of Glendale into the southern sea. And so it was that an Ogre Army came to Hamfest late one autumn evening, secretly as they could, having assembled on the road a day's journey northward. The Ogres were heading south along Glendale road, and came beneath Blueberry Hill. There they massed their elephants into three blocks of six elephants each. 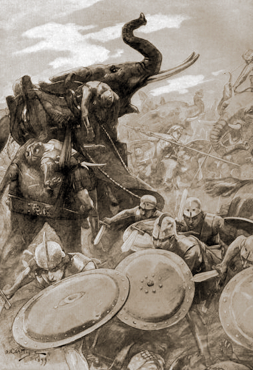 The elephants were mounted by Kobold archers in small towers afixed to the elephants backs. The Ogres formed a phalanx of pike wielders in front of the elephants, while behind the elephants the main army of Goblins and Hobgoblins massed into a huge triangular formation. Hamfest was the first town in their way, and was set to be duly destroyed by fire, pillage and rapine. The Ogres marched the army down the road toward Hamfest, lead by their greatest and most ruthless commander, Throk Llodre, the Crimson Impaler. Having had some small warning in advance from Lord Amoralon the Dragonfly Prince of Feylandia, the Hamfest village was as well fortified as it could be. Behind the wooden wall along the barricades and parapets, were 20 of the best of King Oswald's Barons, 130 Knights in chain-mail and stout kite shields, swords brandished and gleaming, and about 400 infantrymen with pikes, short swords and light armor. They watched the horizon at sunset, as the dust from the approaching Ogre Army rose into the air from the north, the light of their torches shimmering against the dust with an orange glow. Thum, thum, thum, they heard the great deep drums as the Ogre Phalanx rounded the bend and came into view. The army stopped there and began a solemn chanting amid the drums under the light of their thousands of torches. Louder and louder, and faster and faster came the chanting, until midnight, when suddenly all of the Ogre fires went out, and the dreadful scene turned pitch black in the darkness. All that could be heard were the sounds of tramping boots, the horrifying Goblin song, and the long braying and trumpeting of the elephants as the entire mass surged forward through the darkness. It was then that Lord Beltane sent up the signal, which was a green flaring torch tossed high in the air from the bell tower in the center of the village. At the edge of the forest along the western side of the road, safely out of view of the approaching horde, Farmer Giles executed the plan he had hastily devised and recommended to the Barons of Oswaldia. One hundred pigs he had lathered in oil, and contained in a hastily constructed wooden pen whose wide gates faced the road along the western side. Grimly, he lit the pigs on fire with a torch and ordered his retainers to swing the gates open as he perceived the elephants were passing by in their gigantic columns. One hundred flaming war pigs, squealing madly in an agony of pain and madness, came hurtling out of the darkness down the grassy slope toward the elephant columns. Before a single Kobold arrow could be fired the entire mass of elephants, spooked out of their minds, turned and ran pell mell into the crowds of Goblins behind them, crushing hundreds, and scattering the rest into the forests and bogs thereabouts. It was pandemonium for the Ogre Army as long bow arrows began to whistle down in a constant rain onto their ranks from the walls of the village. Ogres, however, do not panic. The Ogres surged forward, their phalanx rattled, but still intact. They had intended to surround the village and guide the elephants into a charge at the gate to break it down, but this plan was now ruined. Thus, instead Throk Llodre barked out the order for the Ogres to charge the village gate and break it down with their maces, and even their bare hands if need be, and so the phalanx began to surge toward the wall in the darkness. Nothing could be seen, but only the roaring, grunting and cursing of Ogres could be heard as they charged thunderously toward the village wall. But at that moment the darkness was broken in numerous places by mystic spells cast from the bell tower, and so the battlefield was illuminated by four brilliant balls of light high over head. By this light the gate of the village opened and out marched the pikemen in formation, followed by the Calvary of knights in shining armor. The Ogres turned to face their enemies and so there was a ferocious battle at the gate of Hamfest village, in which Lord Beltane distinguished himself for valor, as did his fighting men, and as did too Farmer Giles, who had come running up along the road with his own men to join the battle. By dawn the Ogres lay in heaps along the wall, and those not slain fled with Throk Llodre into the forests and far away, back to the Iron Hills from whence they came. Farmer Giles was hailed a hero, and knighted by Lord Beltane. But he had no interest in fame or fortune, or being a Knight, and so he returned to his farm with his retainers, and to this day he lives out past Audax hill, happily herding swine, growing corn, raising his family, and keeping a watch on the northern road. And so, this is how Farmer Giles of Hamfest won his renown and helped to save the citizens of Glendale using an effective, if somewhat cruel stratagem. I've been tooling around with my Play Testers on the question of Guild Classes, and how much Experience it should take to go up in levels. I think we've made some great progress on it, and so, as a kind of teaser, I'm going to toss up the Guild Class Configuration Screen from the Elthos RPG "One Die System" Web Application. In the not too distant future I'm going to ask for Gamesmasters to Beta Test the system. I have no idea, really, how the application and the rules will be received, but I'm hoping that if people are willing to give it a try that they will find it useful and give it a thumbs up. The system is mostly geared toward people who would prefer to play with a rules set that is traditional in nature (based largely off of OD&D) and with small numbers to keep the math easy. 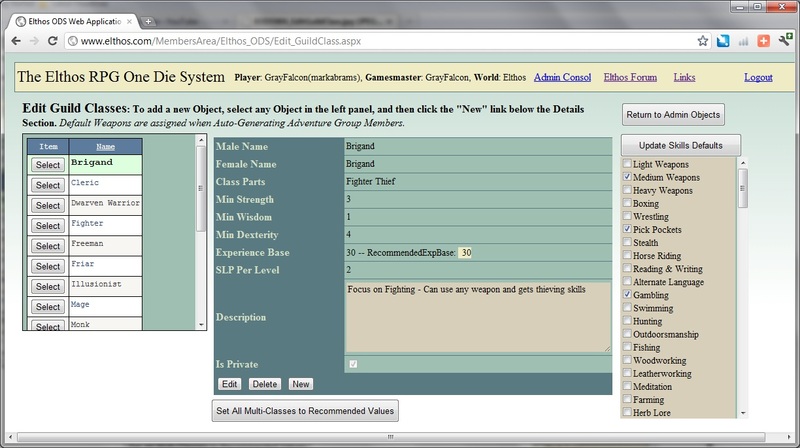 The combat and skills resolution system is very easy to work with, and the character generation can probably be described as medium weight in terms of complexity... but there is the Web Application which does all of the heavy lifting, number crunching, and record keeping chores. And so, there you have it. Progress is being made, and I'm hoping to make the system available to Beta Testers within the next few months. If you happen to be interested in becoming a Beta Tester, please drop me a line via the Blog and I'll add your name to the list to be emailed when it's ready.